Yesterday was a beautiful and chilly day. Our string of balmy autumn days has seemingly come to an end, and yesterday marked the start of mid-October temperatures. While sunny, it was only mid-forties (F) and windy. By late afternoon my long-sleeved shirt and wool sport coat were feeling a bit inadequate. During the best part of the day, early afternoon, I went for a walk with a friend at the local Olbrich Botanical Gardens. 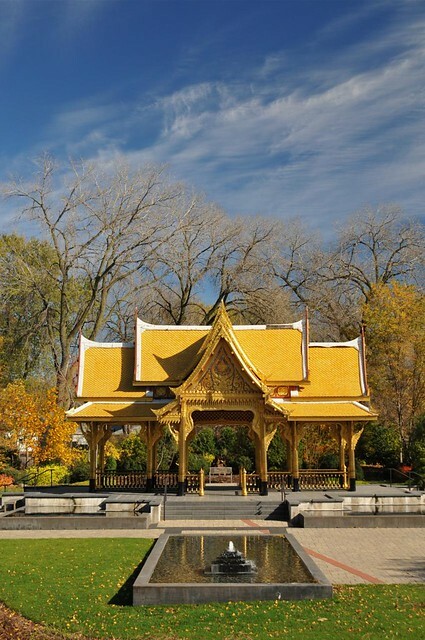 Part of the garden is this lovely Thai pavilion, donated to Madison by a sister city in Thailand, and assembled without nails or screws by Thai workers who were flying in to Madison to do the work on 9/11. The striking sky in this picture is partly because it was an amazing October sky, and partly the influence of a polarizing filter. 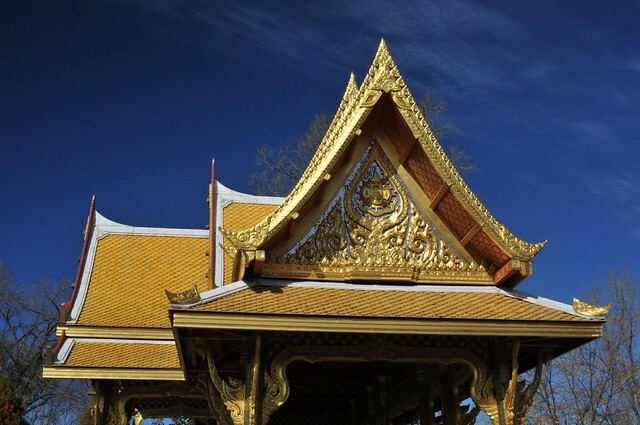 The pavilion is not large, being about the size of a small cottage, and is decorated throughout with gold gilt and mirrored glass. It really is beautiful, and a local treasure. 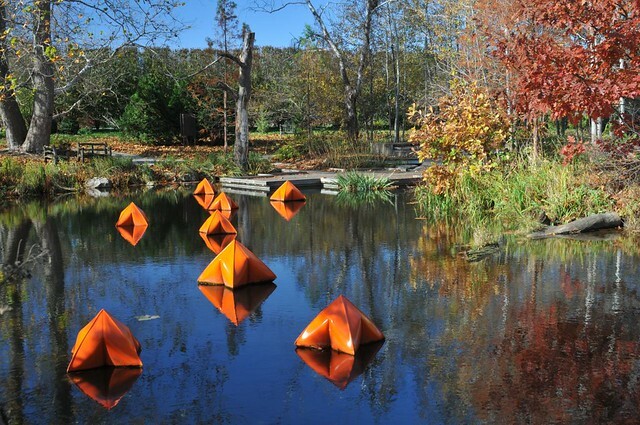 I do not know what these floating bits of sculpture are all about. They are new since I was last at the gardens, and if there was an explanatory sign I failed to see it. They are tethered loosely in place so the wind can move them around somewhat but they will not run ashore. In the area? I recommend you stop in (but maybe wait until next spring...).